How to Trade Hind Zinc to Make Money? We always believe in seeing the charts in true perspective as a chart never lie and History repeats itself. We have identified the "Diamond Bottom" chart pattern formation on Hindustan Zinc which has a BSE code as 500188. This is a pattern which is formed over several months in very active markets. Volume remains high during the formation of this pattern. The Diamond Bottom pattern occurs because prices create higher highs and lower lows in a broadening pattern. Then the trading range gradually narrows after the highs peak and the lows start trending upward. This pattern occurs when prices break upward out of the diamond formation. Remember to go through the embedded links here as it will provide you with a correct perspective for the stock from technical analysis point of view. You can read more about Diamond bottom formation here. To get you started on the path to make money we have analysed the Hind Zinc chart for you and it is showing a bullish bias and we see price may rise from 122 to the range of 131-133 levels. In its upward journey it encounters resistance at 125, 133 and 136 level. These are the levels from which stock can reverse. This pattern is valid if it holds the level of 122 which was a strong resistance for the stock earlier. Any break of 119 level means that stock can fall to the level of 108. How much time it may take to achieve the target? 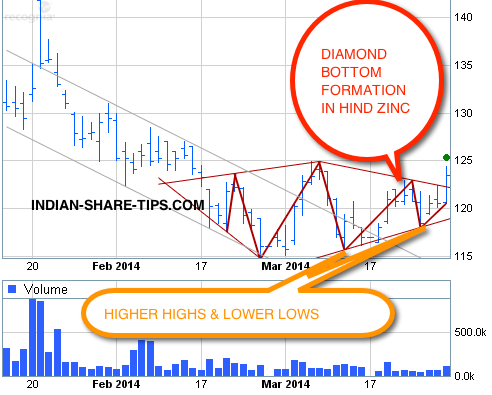 We see that Hind Zinc has formed this pattern spread over some 26 days and upward movement to the given level is also likely to take place in the same time period as technical analysis rules and same has been amply explained in diamond bottom chart formation chart in the given link and way it is to be analysed. Remember to bookmark us for daily intraday tip which gets you more profit in your bank every day.